Once in a while, a work of art comes along to remind me about the expressive storytelling elements that can only be found in the medium of graphic novels. 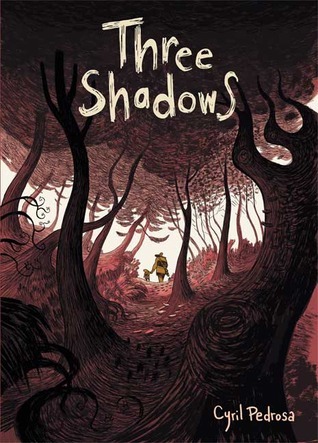 In Cyril Pedrosa’s graphic novel, Three Shadows, he explores the question “what price would you pay to save your child?” Inspired by the agony of watching a friend’s child die young, Pedrosa weaves a tale about the bonds between parent and child that is both tragic and mysterious at the same time. The story starts with the young Joachim and his parents living simply in their country home, their perfect dream an island disconnected from the outside world. This all changes when Joachim begins to be stalked by three shadowy horsemen. Seeking answers about these illusive figures, Joachims mother visits a seer who informs her that the figures will take her son away. Death is stalking her son, and there is no way to avoid it. In an act of defiance, Joachim and his father set out on a journey to cross the river and attempt to lose the three shadows. What progresses is a touching fairytale that is entertaining, humorous, mysterious and tragic. The story is well told and sustains a world that is dream-like while still grounded in reality. The main characters are all interesting and dynamic, and the side characters support the cast well enough to be memorable. The particular bond between Joachim and his father Louis is one you don’t often see in popular storytelling. The relationship is caring and affectionate rather than tough and laden with issues. Think along the lines of Finding Nemo as opposed to 300. Overall, the storytelling is well paced and benefits from a interesting plot that never grows stale. Where the story shines particularly bright is in the artwork. Pedrosa was a former animator for Disney, but his brilliance really breaks out in this work. The long ink strokes invoke movement better than any other graphic art I’ve ever seen. The world appears to be shifting, and the characters move seamlessly panel by panel. The aesthetic is fitting for the tale and reminded me of ancient Japanese art, Disney and the works of Dr. Seuss. In conclusion, this is excellent piece of art that I could find no issues with. I would recommend it to anyone who enjoys the artistic merit of the comic medium and even to anyone who doesn’t. ← Calling All Canadian Heroes! Your Country Needs You!